I just recently came across Gritty Spanish and it grabbed my attention as soon as I saw it. There are a lot of products to help you learn Spanish, but not many like this one. I’m going to give you a tour of Gritty Spanish and tell you why it’s so different from everything else and why I think it’s worth your hard-earned plata (cash). The official Gritty Spanish web site has a lot of information about the product, it’s actually very informative, much more so than many other product websites. With that said, it’s always nice to get an opinion of someone who has used the product, so I’m going to share my feedback with you. To start off with, Gritty Spanish targets intermediate and advanced students. Its got 31 dialogues (MP3 format) with matching PDF’s. Since we’re on the topic of dialogues, let’s talk about those. I’ve seen a good amount of learning Spanish dialogues, and I can tell you for a fact they don’t have titles like these. Just as the name Gritty Spanish suggests, the dialogues are edgy and very realistic. These are conversations and situations that take place between people everyday, using the language people use everyday. One of things that I believe is missing in the majority of learning Spanish products is just that, the Spanish people use day in and day out. Here’s a sample dialog. Not all of the dialogues are as gritty as this one, but it’s a fun one. If you want to see a few more samples you can just go directly to the Gritty Spanish website. Let’s talk about some other aspects of Gritty Spanish. The sound quality is excellent. The recordings are very high quality with great sound effects that make the dialogues feel even more realistic. It’s obvious a lot work went into putting the audio together. Each dialog has it’s own sound effects that makes it feel even more natural. I got the feeling I was actually there, in the scene being set by the actors. As you listen to the MP3’s you can also view the Spanish text and the English translation, they’ve been included in the file as lyrics. I discovered this by accident, but it’s a nice feature. And while MP3 tags are far from the most important feature of a dialog, they are well done and make the dialogues easy to organize and search on your smartphone, tablet or iPod. I really like this because I spend a lot of time updating the MP3 tags on other podcasts/audio files. The length of the conversations vary between almost 4 minutes to a max of 10. I personally think is the perfect length. And there’s a version of each conversation that’s 25% slower. While I don’t believe they speak incredibly fast in the natural speed versions, they talk at a good pace that at times might be challenging to keep up with depending on your level and exposure to Spanish. The normal speed files and the 25% slower files are in separate folders, which I also like. The list of the conversation titles pretty much says it all. In Gritty Spanish you’ll hear people ordering food and drinks, trying on clothes, haggling, arguing, swearing, shopping, talking about sports, gossiping and more. The dialogues are fun and interesting. I mean, who doesn’t enjoy listening to a jealous girlfriend getting on her boyfriends case about a woman who doesn’t belong on his Facebook page? Or a racist cab driver, road rage or even a friendly chat about baseball? The voice actors do a very good job of bringing the stories to life and you’ll hear several different accents – Mexican, Dominican, Colombian, Puerto Rican and Argentinian. This is important because you don’t always get to choose who you speak Spanish with and being able to understand various accents is a plus. There is also a PDF that talks exclusively about the voice actors and identifies the nationality of each voice actor in the scene. I think that was a very nice touch. In general the conversations include a fair amount of profanity, some more than others, so keep that in mind if you’re sensitive to that. The profanity they use is pretty neutral and would be understood in any country. In fact, I would say the Spanish as a whole is very neutral, so you’re learning Spanish that can be understood by Spanish speakers everywhere. The PDF’s have a very polished and professional look. 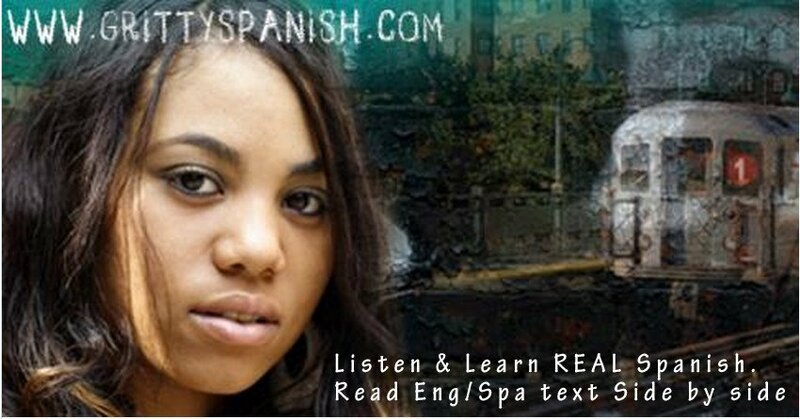 Each PDF has a synopsis with the English and Spanish side-by-side. You get a PDF that includes all the conversations in one file. There’s also a .mobi version for your Kindle. You also get a separate PDF for each dialog, but there are no corresponding Kindle versions for the individual PDF files. The translations are accurate. There are no grammar explanations, but I consider this to be a conversational Spanish resource, so I personally don’t see that as a big deal. I own a lot of learning Spanish products, so I debated for several days before buying my copy, but I have to admit I’ve been enjoying it. It took a lot of effort not to listen to all the dialogues on the first day. I really got in sucked by conversations and they kept me wanting more. What’s wrong with Gritty Spanish? So you may be wondering if there’s anything negative about Gritty Spanish. In my humble opinion, no. I would have made some different choices in some of the translations, but translation is not an exact science and two translators will come up with different translations with both of them being equally correct. 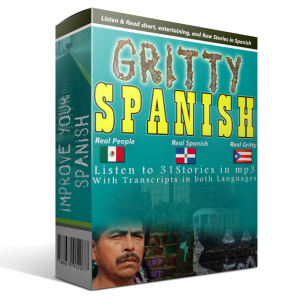 Spoken Spanish is very regional with each country having its preferred manner of speaking and I would say Gritty Spanish qualifies as US Spanish. It’s just as valid as Spanish in any other region, and it’s perfectly understandable in any country, so I don’t a see a problem there. By the way, if you’re wondering what the difference is between US Spanish and what I’ll loosely call standard Spanish (to be honest I’m beginning to doubt that that such a thing exists), you can check out this book, Speaking Spanish in the USA. 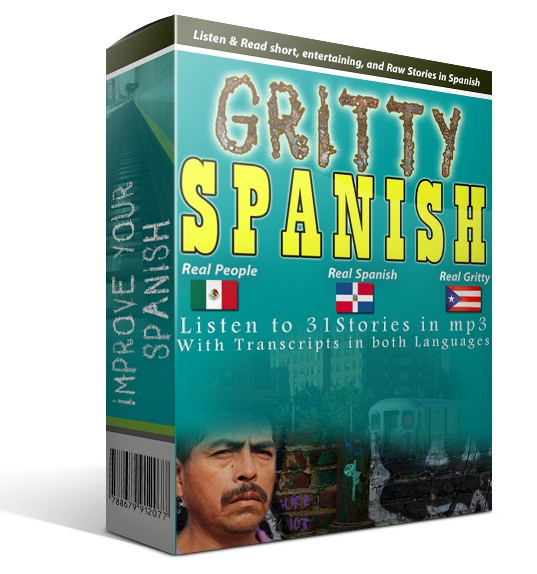 All things said and done, this is a solid and very unique product that will make a great addition to your Spanish toolbox. That’s it! Go forth and get your copy of Gritty Spanish, I’m positive you’ll love it as much I do.